The Iron Dome defense system has been installed in northern Israel, according to the IDF, due to the escalating civil war in Syria. 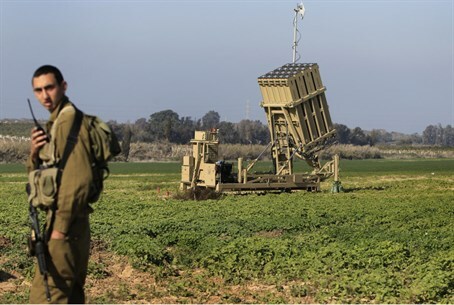 The Iron Dome anti-missile defense system has been installed in northern Israel, according to the IDF, due to the escalating civil war in Syria. The move comes in response to increasing concerns that Syrian President Bashar al-Assad may lose control over the chemical weapons arsenal in the country. Should that occur, the lethal arsenal held by Israel’s northern neighbor could be handed over, or become vulnerable to theft by a number of Islamic terrorist organizations, among them Hizbullah or Al Qaeda. Turkey has already requested -- and received -- Patriot anti-missile batteries from NATO for the essentially same reasons. Iron Dome anti-missile batteries have been deployed in multiple locations, including in the Haifa area, military officials said. In order to be effective, chemical weapons must be released at a range that is relatively close to their targets. The chemicals, some of which are released in gaseous form, are loaded into warheads on missiles that are fired either from the ground or from fighter planes. Iron Dome batteries proved their effectiveness in the interception of such missiles during Operation Pillar of Defense, the recent counter terror offensive against Gaza’s terror organizations. The anti-missile systems knocked out more than 80 percent of the medium and long-range missiles aimed at major cities in southern and central Israel. Defense Minister Ehud Barak told reporters at a Pentagon news conference last November that due to the Iron Dome system, "only 55 rockets out of the 1,500 ended up falling in urban areas." He added that about 85 percent of the interceptions succeeded.